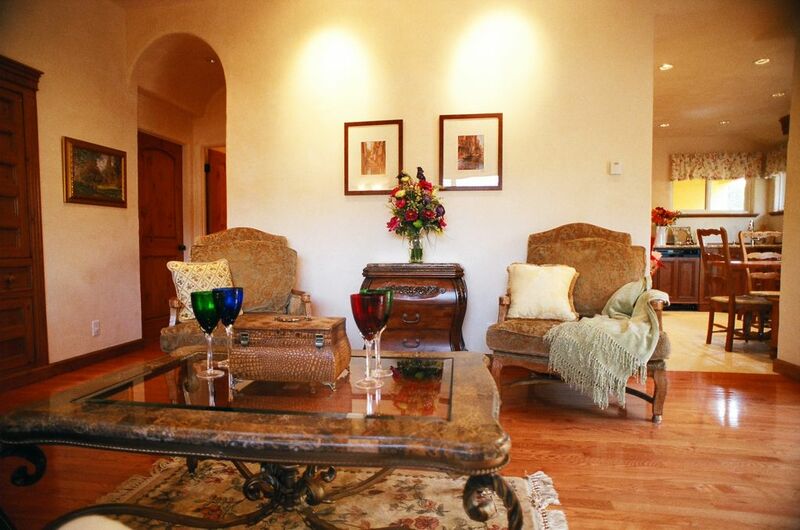 Welcome to our Santa Barbara Ocean Getaway which is the best value for a 2BR/2BA in Santa Barbara. It is unmatched for its location, quality and price! We are not in Carpentaria, Goleta, Summerland or Montecito. We are also not in the suburbs of Santa Barbara such as San Roque, Mission Canyon, Los Positas etc. We are in the coveted Historic West Beach area, steps from the beach, Las Banos Public Pool, Stearns Wharf, Harbor, world-class dining, and downtown shops, including our own local farmers market. We are not next to the railroad tracks, highway or on a commercial thoroughfare. Leave your car and associated traffic/parking worries behind. We even offer RARE off street reserved parking. The Ocean Getaway resides in a historical turn of the century building and retains the charm of the day’s bygone. It has been lovingly restored to reflect Santa Barbara's style including hand cast plaster, 10 feet vaulted ceilings and Waterford fireplace giving it both a romantic and European feeling. The sparkling open and fully equipped kitchen was designed with high quality construction, including granite countertops, limestone floors, custom cabinets made by our own local cabinet maker, PJ Mulligan, that are complimented with high end appliances: Subzero refrigerator, Wolf cook top stove, oven, dishwasher, microwave, expresso machine and of course a washer and dryer. The dining room table accommodates up to 6. There are also two tables and chair sets in the private encassed interior courtyard. The warm and cozy living room is a great gathering area with hardwood floors, Waterford fireplace, 50-inch Plasma TV, and stereo to add to its ambiance. The leather couch has a queen size sleeper and accompanies two comfortable over-stuffed venetian chairs and an antique Louis VIV desk. Complimentary broadband wireless internet is provided throughout. The king bedroom offers a 40” HDTV with an accompanying bathroom that includes a walk in shower. The queen bedroom has with a 20' HDTV and accompanying bathroom with shower/tub combination. The bathrooms are new and done with limestone floors, granite countertops and custom Santa Barbara-style cabinets. When you book with us, you are booking directly with the owners, which means you are not dealing with a management company, or a 3rd party call center, or a computerized mobile application. Often times the 3rd party does not live in town or even know the property. We know our properties intimately, as we both own and manage them, and have a 15+ year track record. Our twenty six FIVE star reviews speak for themselves, including our cleanliness. Also our history as a vacation rental ensures that the property will be delivered. Unfortunately there are some fraudulent offerings and sometimes rental agencies have the ability to 'substitute' your property with another. Upon booking, directions are emailed along with our contact information, Restaurant Recommendations, Winery and Activities Recommendations and Welcome Notes providing detailed information about the Beach Getaway. In this way, you can drive right to the Getaway, which has a lock box where you’ll use your unique code to enter. There is no need to set up an appointment. Inside, you'll enjoy premium amenities: shampoo, soaps, paper & cleaning products, and 5 star quality bath and beach towels, linens and cleaniness. And we offer complimentary champagne upon your arrival. While priced slightly higher than most 1BR/1BA’s, the Ocean Getaway offers a comfortable stay for 2 couples or a small family. Most of the single hotel rooms are priced higher and yet our Ocean Getaway offers so much more. We welcome a comparison to the 200+ vacation rentals and Hotels as we are unmatched in location, quality & price! The Exceptional Ocean Getaway is a rare retreat in both its location and amenities. A winning combination of location, quality and price! We fell in love with the downtown Santa Barbara and found this fabulous historical property that needed an owner to give it tender loving care and this is exactly what we did. We leveraged a lifetime of rebuilding properties and for this property we did it for fun - it has been our joy. We completely remodeled to reflect the true Santa Barbara style and ambiance with hand cast plaster, limestone and wood floors, waterford fireplace to name a few. Location, location, location and history. We are located in West Beach, 2 blocks to the sand and 2 blocks from downtown, in a nice residential area. We are not adjacent the highway, railroad tracks or on a commercial street. The quality of this property and its location are extremely rate which is what prompted us to buy this gem. As a historical building it has a lot of land encompassing it and private reserved parking which is rare. The benefit of our Ocean Getaway is that you can truly enjoy Santa Barbara, its beach and its unique beauty and personality, as opposed to being in outlying suburban areas, that look like any other or for that matter some of the pictures may look good but the neighborhood is not up to par. We are unmatched in location, quality and price. 2 blocks to West beach and Public Pool. 2 more blocks to Stearns Wharf & State Street. In the opposite direction, within two blocks, is the Harbor and Marina. BEST LOCATION IN SANTA BARBARA. Walking distance to all with private reserved parking. The Santa Barbara Athletic Club is a 5 minute walk and offers temporary memberships. Coffee maker and grinder and expresso maching. Please see photo on website and in addition to the kitchen dining table, there are two table and chair sets outside in the private courtyard. Check-In is 4 PM Check-Out is 11 AM SEE OUR TWENTY SIX 5 STAR INDEPENDENT REVIEWS! We had an emergency on the first night of arrival. We called number of times and also left the voice mail. It is really surprising that our call wasn’t returned for our entire stay. This is not acceptable. Overall property is nice. Great location and lived up to all the descriptions. Stepping into the apartment, I felt like I might be stepping into my grandparents' house, if my grandparents lived in Santa Barbara and had some money :-). The furnishings are vintage or antiques, in very good condition and sturdy enough that you don't have to worry. The bathrooms are new, so it's the best mix of new and old. It's easy to get to the harbor and downtown from the location, and the patio and fountain make the place feel like the California dream. There is no air conditioning, but all the windows open and there are two box fans, which made it very comfortable. We enjoyed our stay in Santa Barbara. The home was beautiful with a tranquil fountain on a private courtyard where we would enjoy a glass of wine in the late afternoon. Our only complaint,coming from the Texas heat, was the lack of A/C. The temperatures were warm during the day in Santa Barbara, so the house heated up. Electric Fans are provided for each room. I’m sure most of the year A/C isn’t needed but the week mid July we were there it was on the warm side. There are 900+ vacation rentals in the 'Santa Barbara Area'. Vacation rentals pricing follow the same trend as real estate pricing - location, location. The farther out you go out of Santa Barbara, the less expensive the real estate and the better the vacation rental pricing. We are located in the best area of Santa Barbara - the Historic West Beach Area - 2 blocks to the Beach and downtown Santa Barbara, yet not on a commercial thoroughfare, not next to the railroad tracks or not adjacent a highway. And we offer private reserved parking. In addition to location, look at our property and compare amenities and pricing. We are unmatched. The 15% Tax Rate is for 12% TOT Tax and 3% Homeaway fee to owner. $600 refundable damage security deposit. 3 night rate reduced the longer the stay, i.e. 4 nights versus 3, 5 nights versus 4 etc.. Rates assume party of 4. High Season rates for Holidays, Graduation week & Spring Break. Inquire for monthly rates which depend on length of stay & season. Maximum occupancy up to 6. 50% of the rent, tax, cleaning fee & damage security deposit are required to confirm a reservation with the remaining 50% due 30 days before check-in.